If you've ever been to Walmart's nail polish display, you are probably familiar with the brand "Pure Ice". Pure Ice polishes come in many different colors and are very affordable at just $1.99 each. I am sharing a few of their shades with you today. 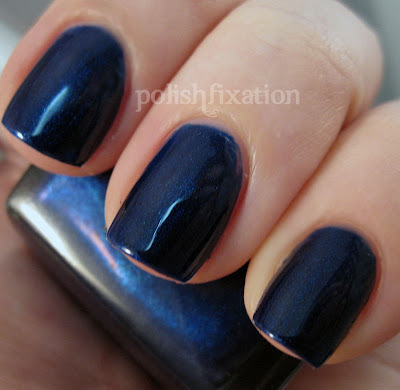 This is a really shimmery deep blue. It looks darker in the pics than it does in person. The formula was easy to work with and this was 2 coats. It's super shiny! Not Now is a green/bluish shade. Kind of like a peacock color. I was not disappointed at all with the color. It's SO pretty! Also a 2-coater. I could not get a decent picture at all of this color! This is a 1-coater shimmery shiny red, but it's way less "cherry" colored than the picture shows. I fell in love with it the instant the brush hit my nail. You'll have to take a look at this one in person so you can see the true color. Ir's amazing. 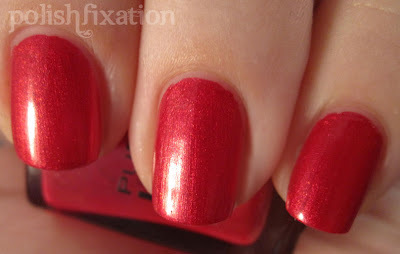 I was a little disappointed that with a name like "bite me" that it wasn't a vampy blood red, but that's just the vampire lover in me. This is a coppery/gold color which doesn't really do much for my skin tone at all...I am not usually a fan of shades like this. That being said, there are many skin tones that this would look stunning on, and the polish itself is very nice and easy to apply. Two even coats. You can see brush strokes a little but not too badly. I LOVE Pure Ice, and I don't have any of these! I love how bright these colors are! Very pretty! Lovely.I like the first two lot! Pure Ice was a BIG brand up here (NYC) when I was growing up. It was available at Rite Aid's back then. We don't have Wal-Marts here (or Walgreens, really - there are very few), so these are tough for me to get my hands on nowadays. That makes me sad cuz they make such beautiful colors! nice colors i love pure ice. I like Pure Ice polishes! I wish my Walmart had better stock though! I have heartbreaker and that's a pretty polish for layering! I agree with you on Bite Me-love the name though!